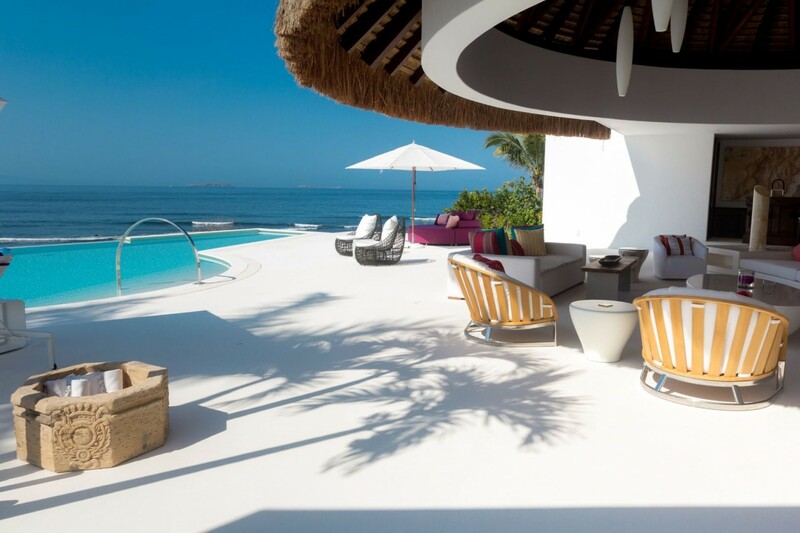 Welcome to Casa Aquila, an extravagant 8-bedroom on the uppermost edge of the Bay of Banderas, at the very tip of Punta Mita, Mexico. 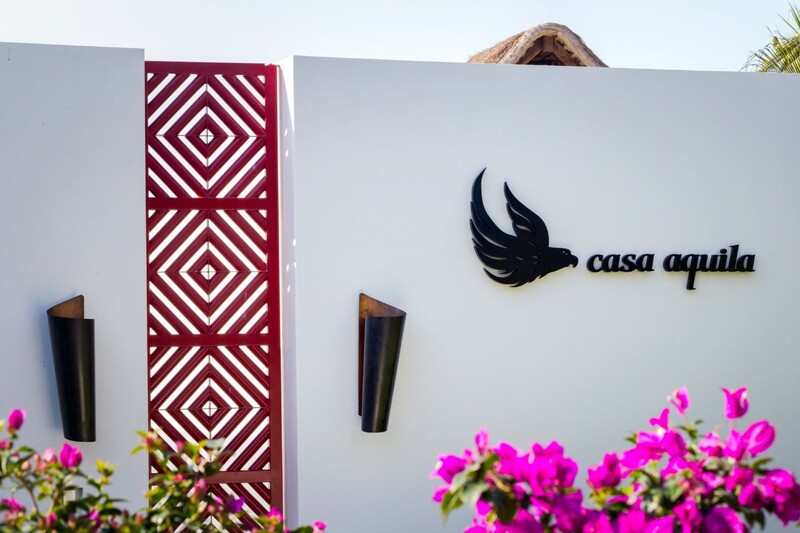 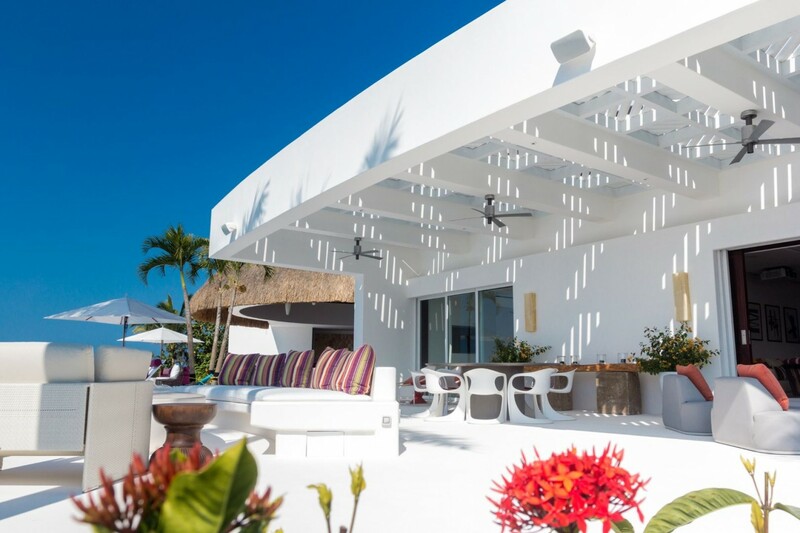 Dominated by the extraordinary palapa that sits at the centre of the building like a crown, the villa sits on approximately an acre of ground, with ample space on all sides to relish the privacy and comfort that Casa Aquila offers. 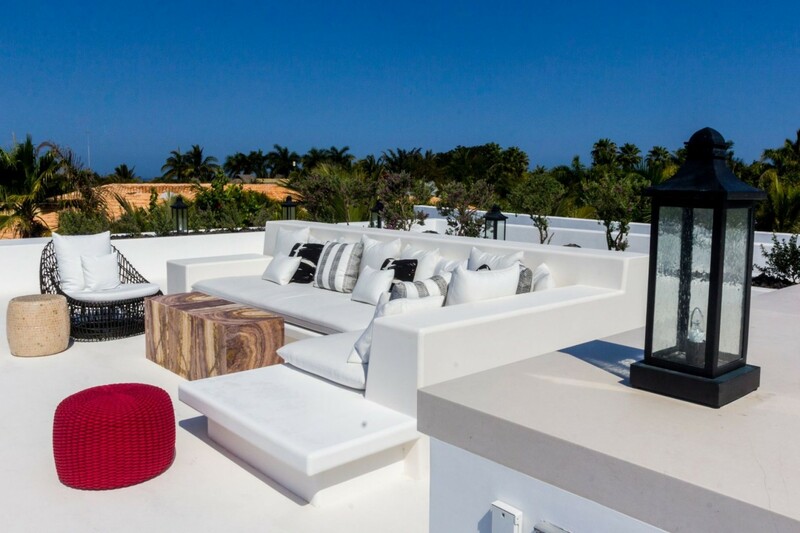 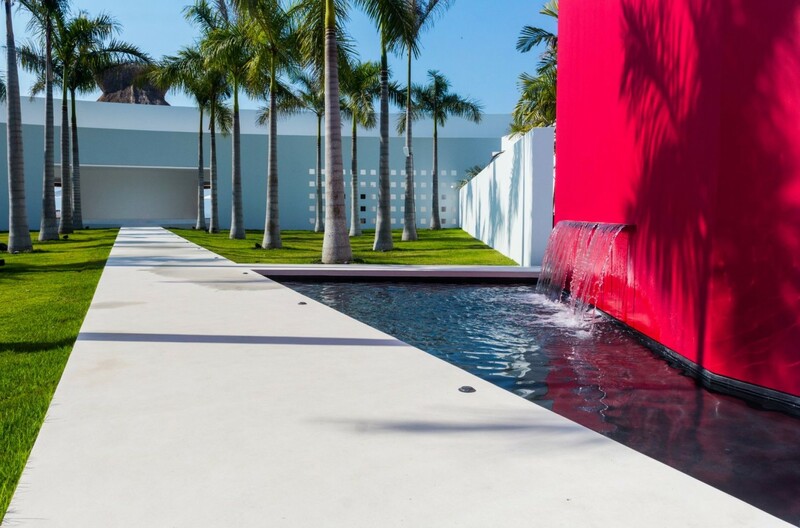 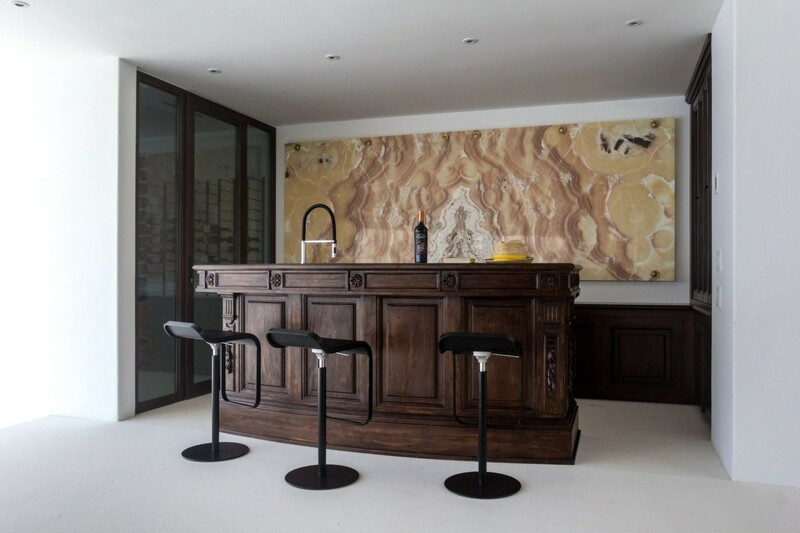 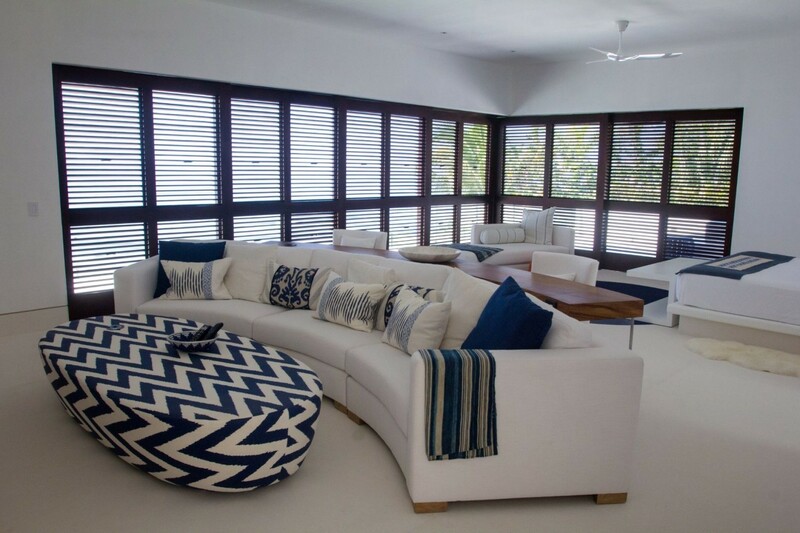 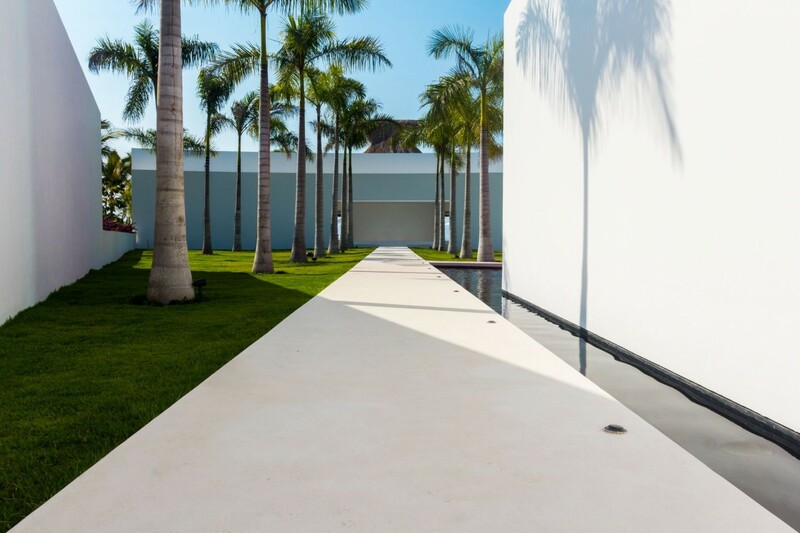 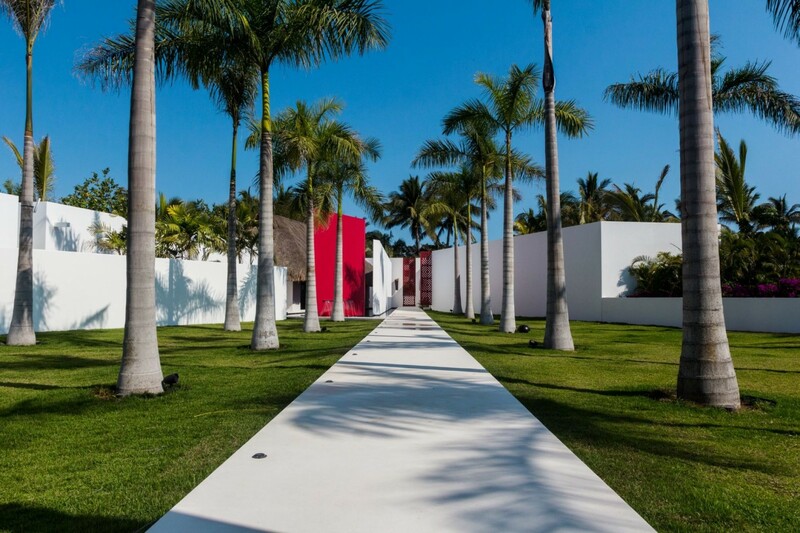 Designed by esteemed architect Jose de Yturbe, this expansive villa is a masterwork in modern design and architecture. 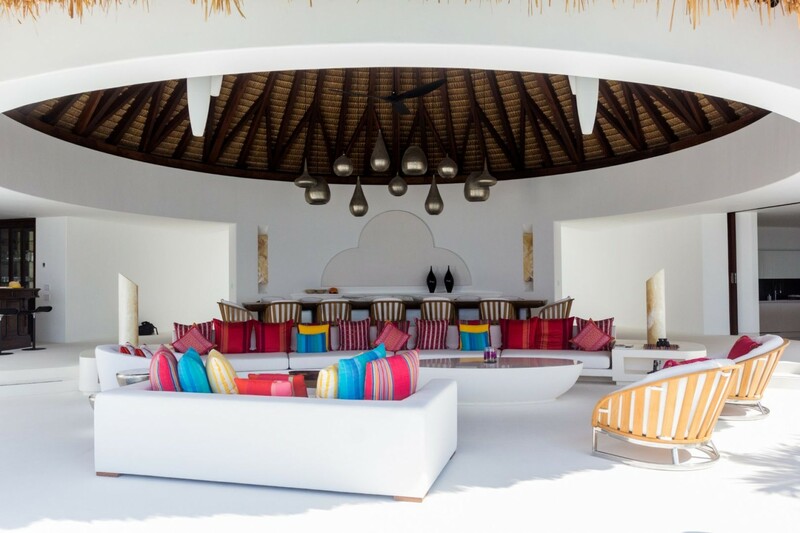 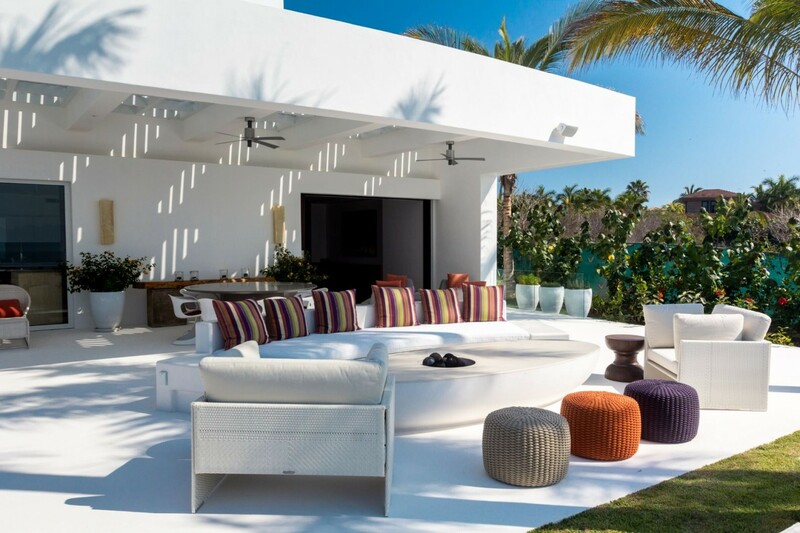 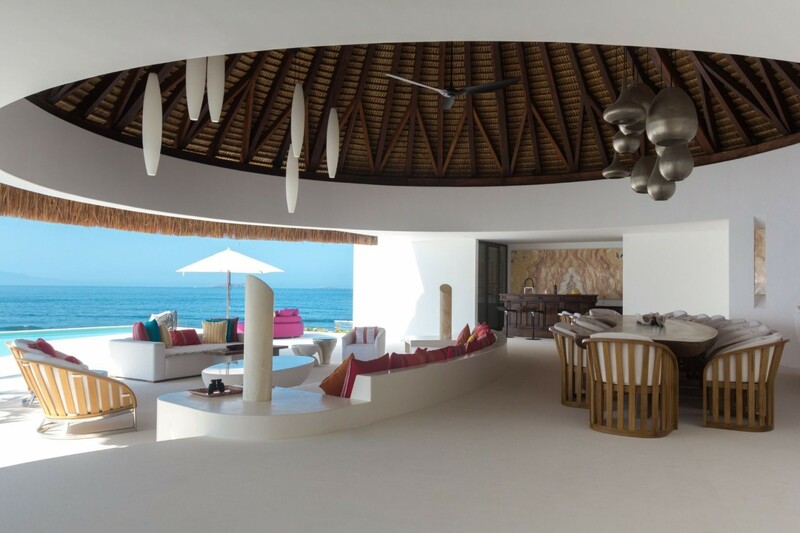 Smooth white walls take on a curvature that gives way to the thatch of the large palapa that resides over the shaded outer lounge, replete with comfortable seating, dining table and bar under the lofty ceiling. 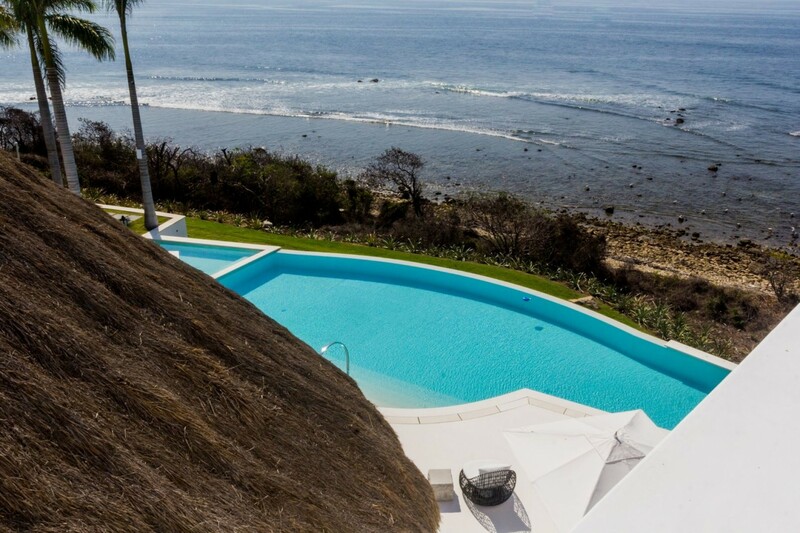 The terrace extends out to frame a magnificent infinity edge pool that gives the illusion that the water of the Pacific has risen to meet it. 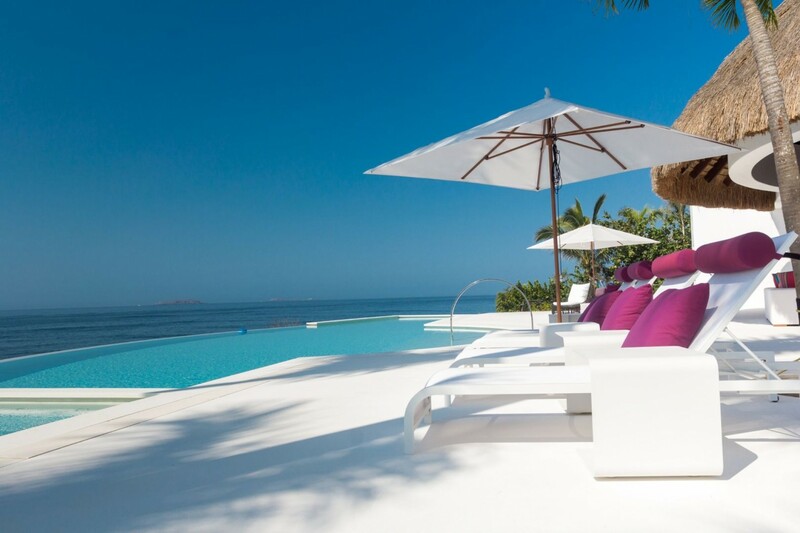 Sun loungers, parasols and comfortable chairs extend up and down the sun-bleached terrace and line the edge of the pool, making it perfect for guests looking to soak up the goodness of the sun, to the ambient sounds of the ocean lapping at the shore – the pool is never far away to enjoy a quick plunge into cooler waters. 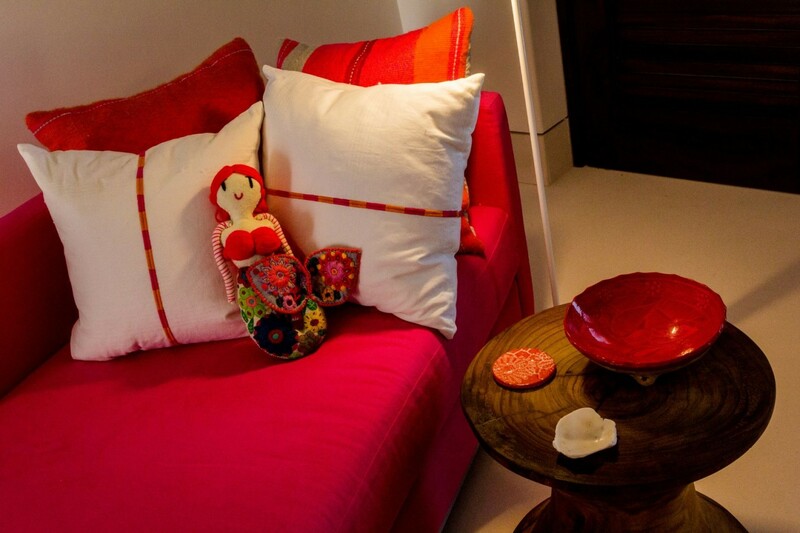 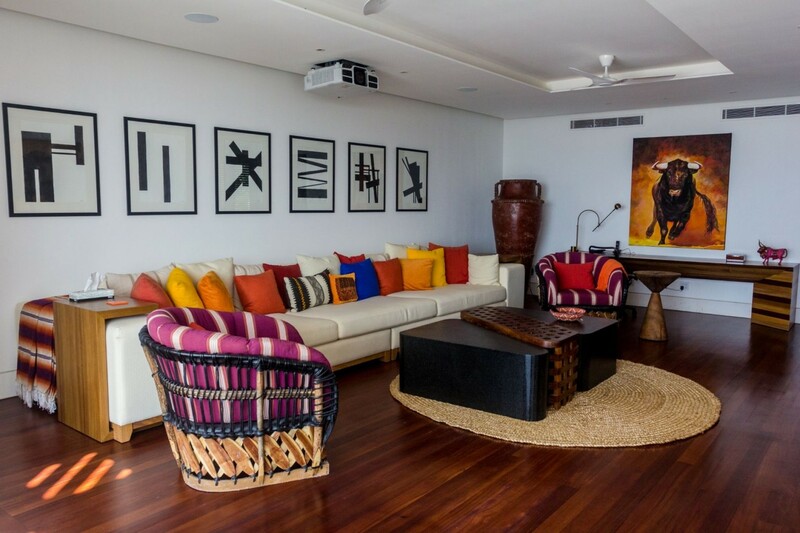 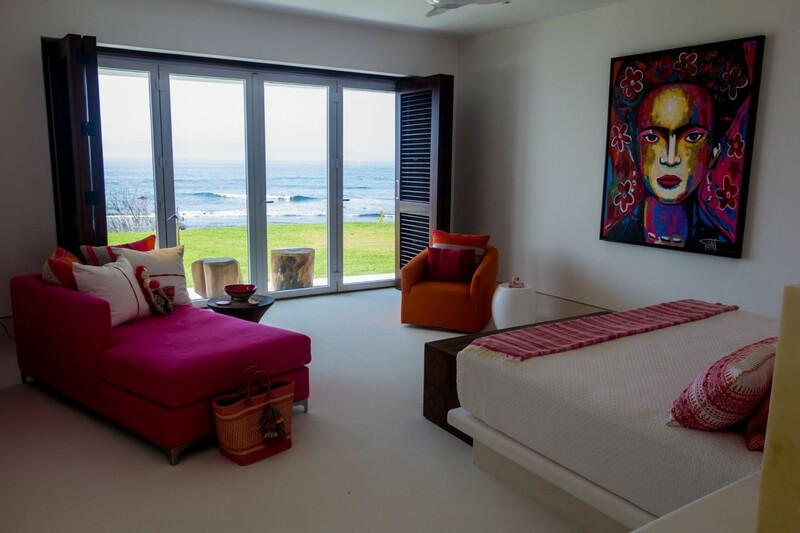 The interior, colourful and fun, maintains the contemporary aesthetic that dresses the exterior; white walls interspersed with unique artwork and art installations are complimented with bright pops of colour in the furnishings and upholstery. 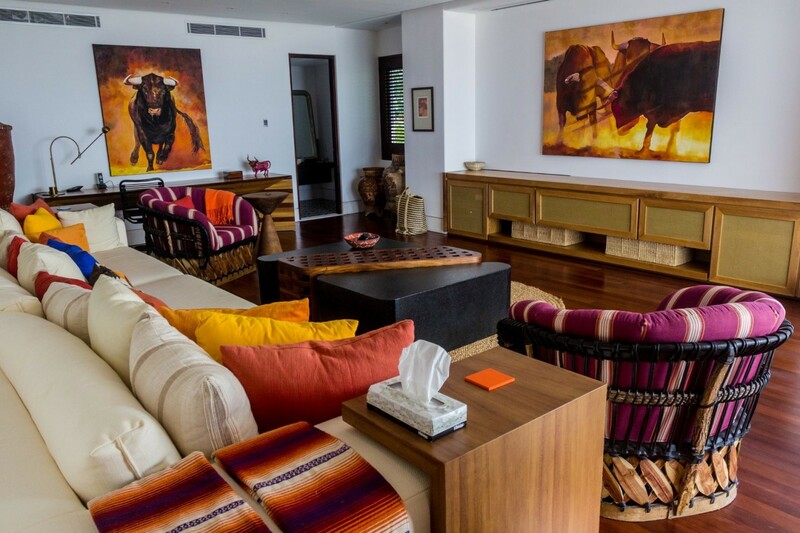 The lounge areas are comfortable and spacious, with ample room to spread out and relax in, either to enjoy conversation and company of family and friends or take a quiet moment to engage in some downtime in front of the TV. 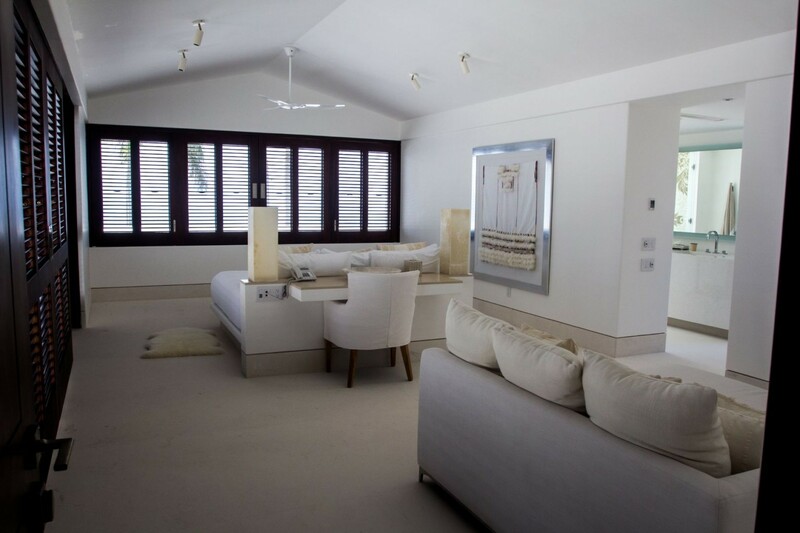 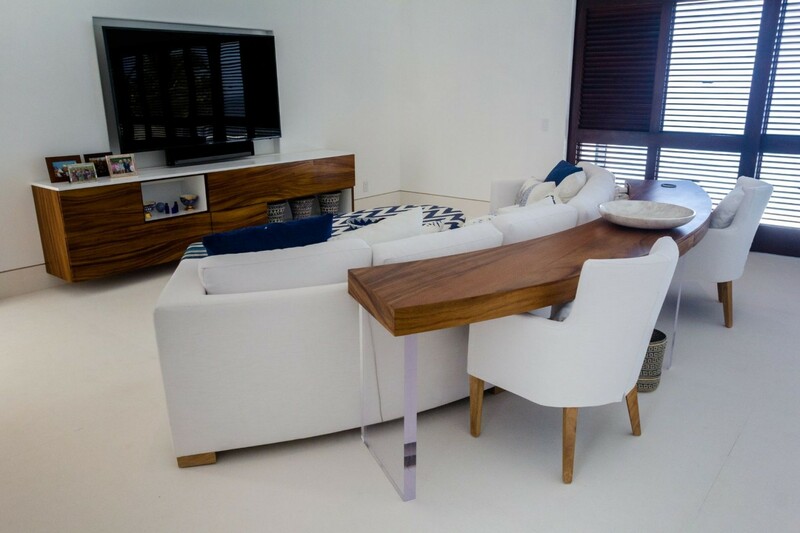 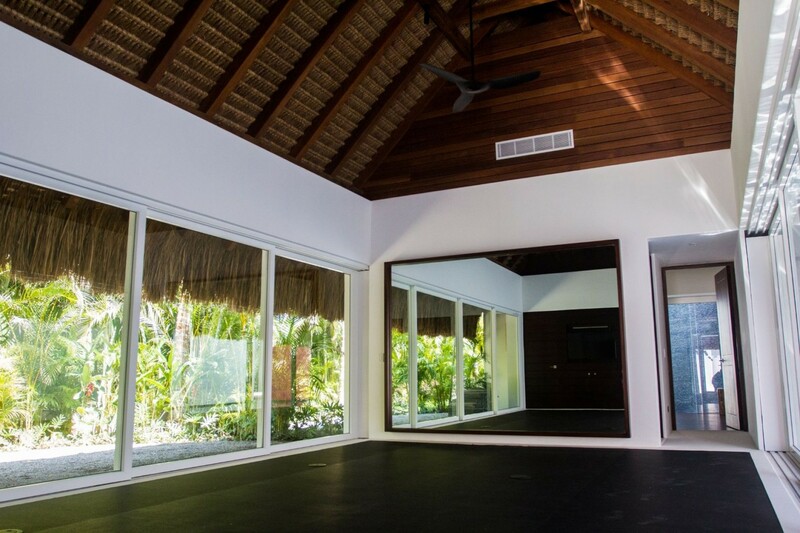 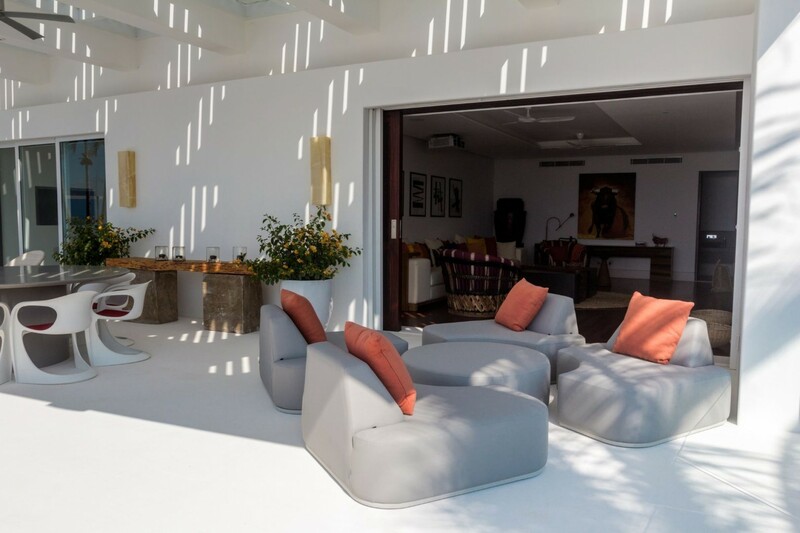 A media room equipped with a projector and surround sound system brings home the experience and magic of the silver screen into the privacy and comfort of the villa. 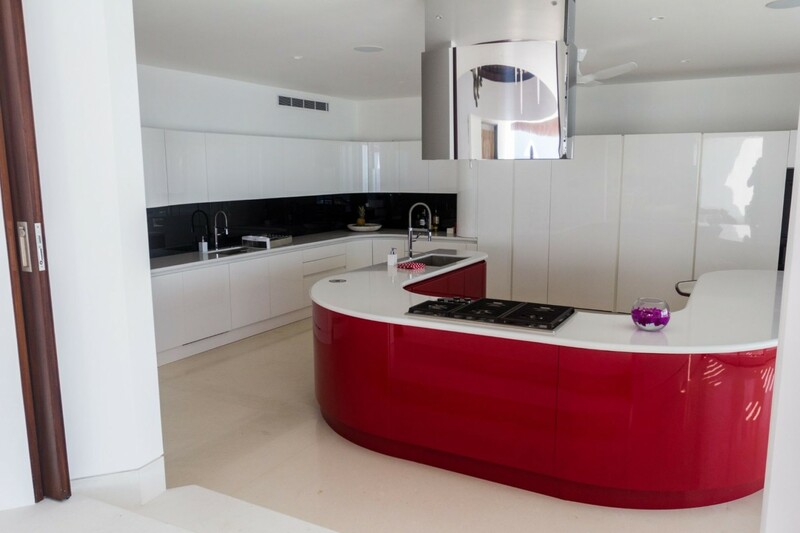 A chic and stylish kitchen, fully equipped with state-of-the-art appliances and bright, sleek cabinetry sits adjacent to the lounge area under the palapa, making it a cinch to organize dinner al fresco, and in the hands of a professional chef, has the capacity to produce fantastic cuisine, made with local produce, without the toil and effort of preparation that comes with cooking delicious meals. 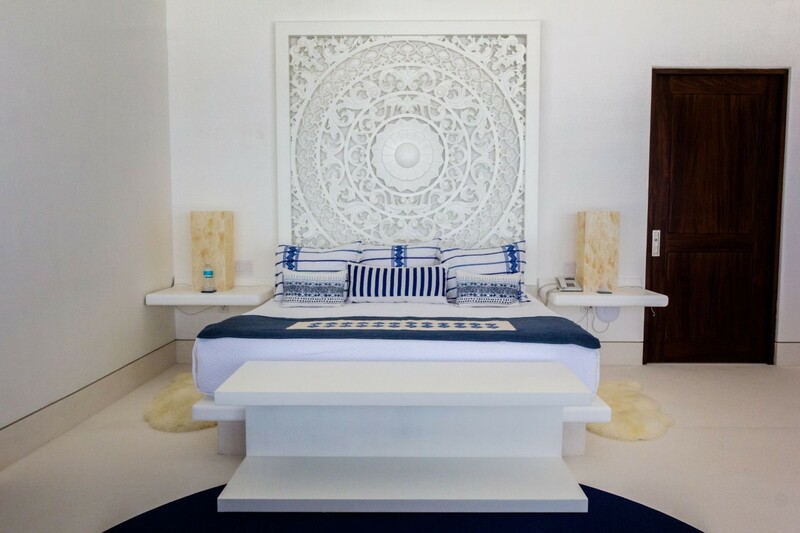 The bedrooms take the meaning of luxury to task; palatial beds and bedding grace each room, revitalizing and restoring, guaranteeing restful and serene sleep to every guest. 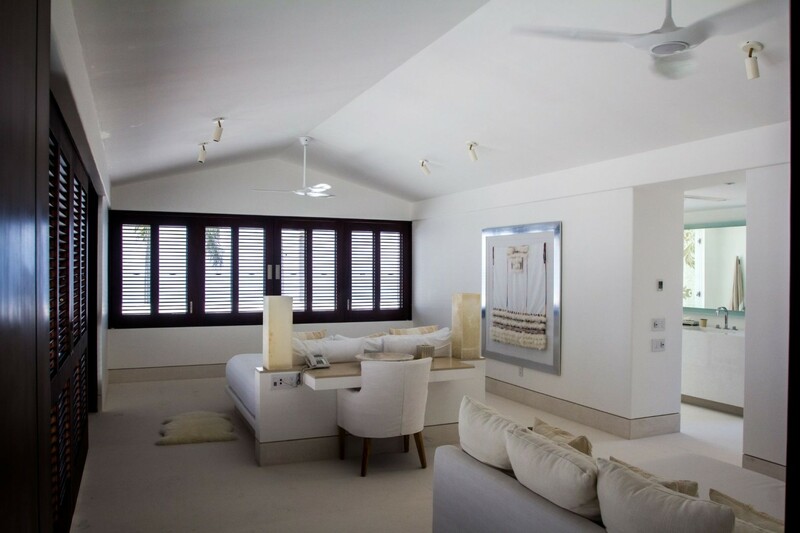 Clean, uncluttered rooms are thoughtfully designed, seeking to instill calm in those who enter. 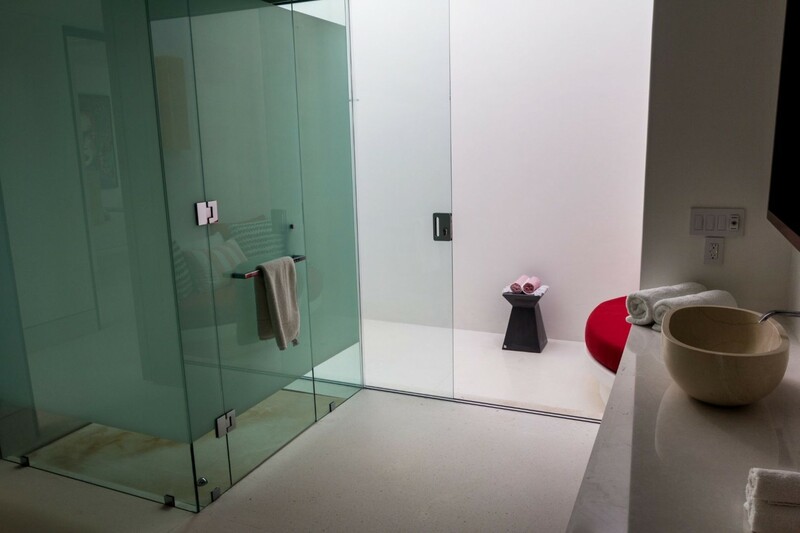 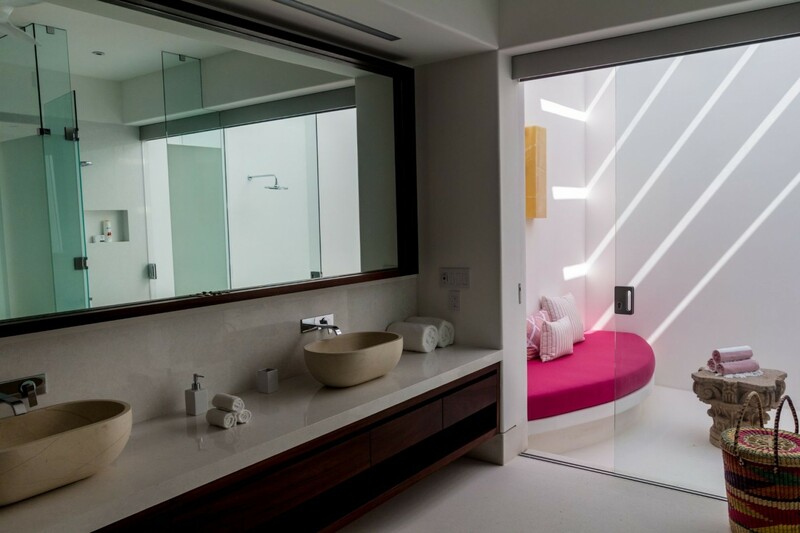 Every room is equipped with an en-suite bathroom, with walk-in showers, that may wash away the cares of the day and soothe the body from a long day of adventuring and activity. 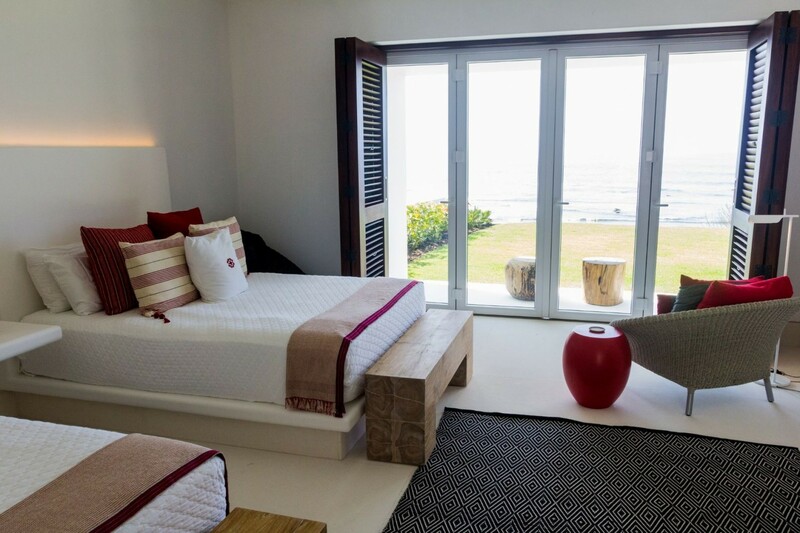 The two master suites offer the utmost in luxury; a private terrace with a perfect panoramic view of the ocean can be seen from the plush couches and coffee tables that reside within the spacious suites, an ideal spot for early risers to enjoy a coffee to the morning sunrise. 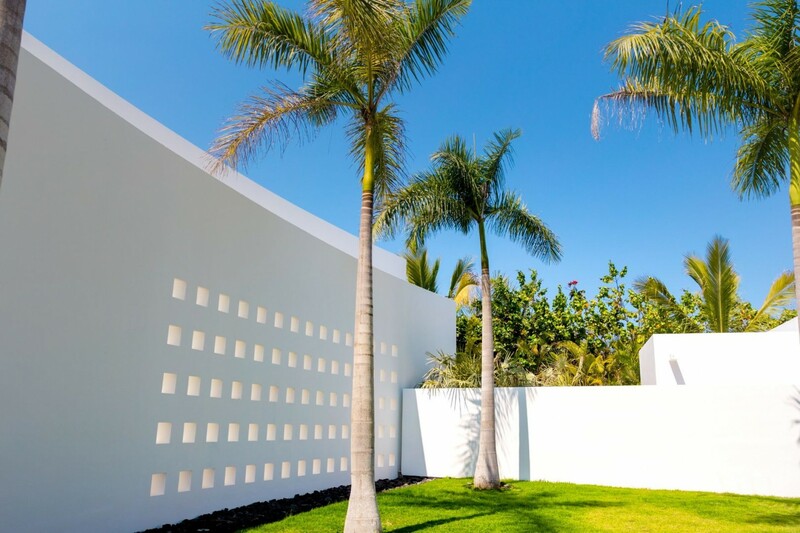 Three other bedrooms also look out onto the ocean, whereas the other three enjoy the verdant green of the private gardens outside their terrace doors. 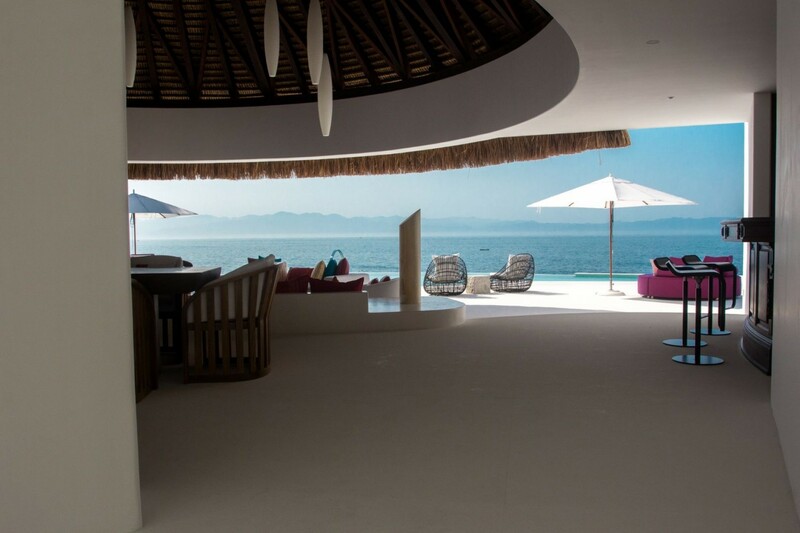 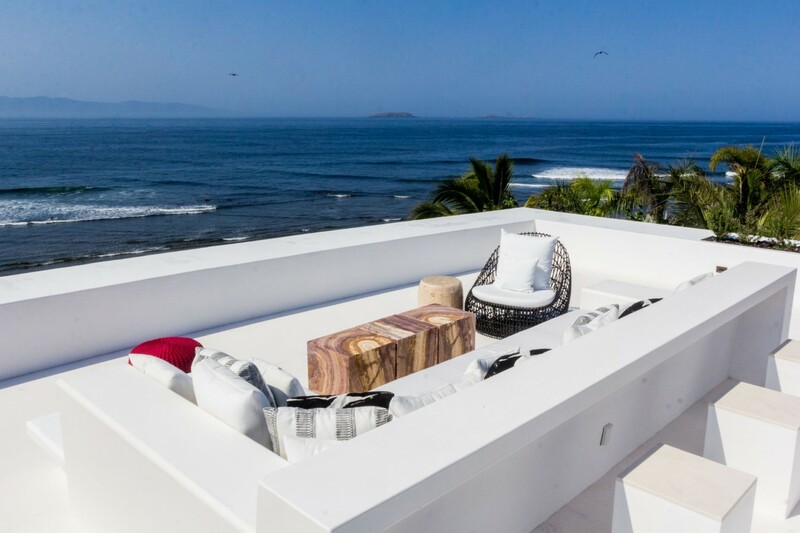 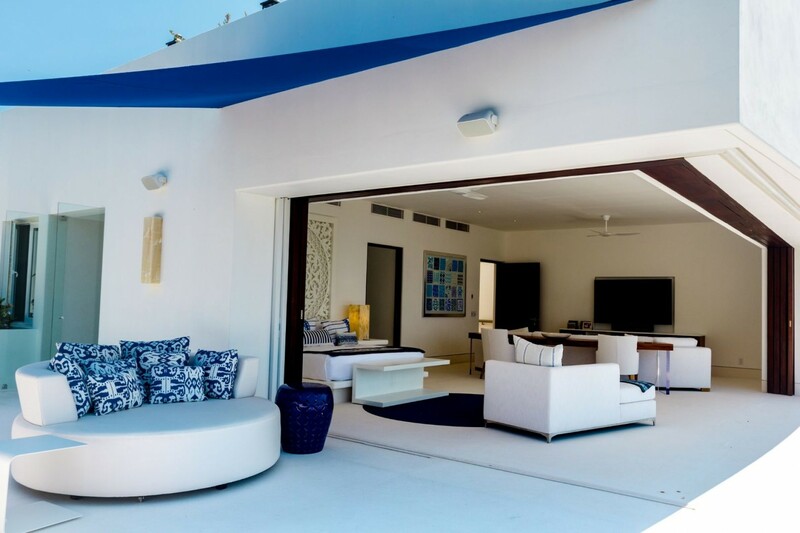 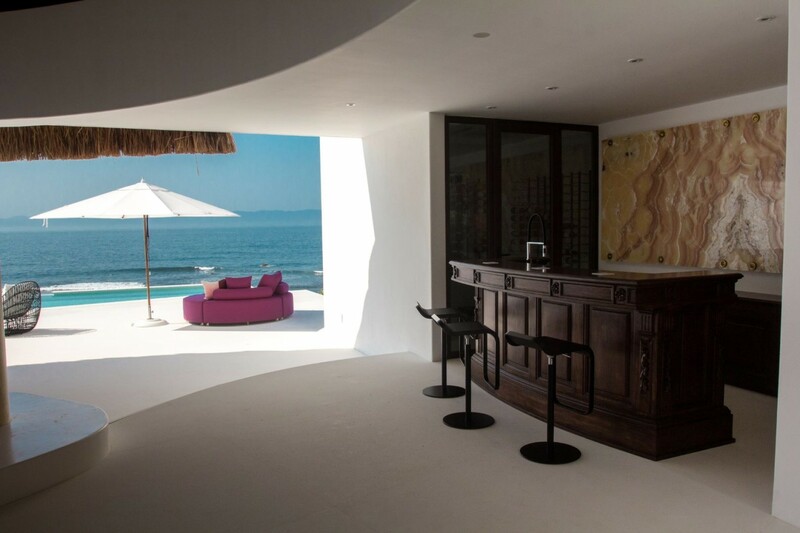 Located on the uppermost edge of the Bay of Banderas, at the very tip of Punta Mita, the villa overlooks the vast expanse of the Pacific Ocean with panoramic display, with an unobscured view of the glorious sunsets that grace Mexico’s shores. 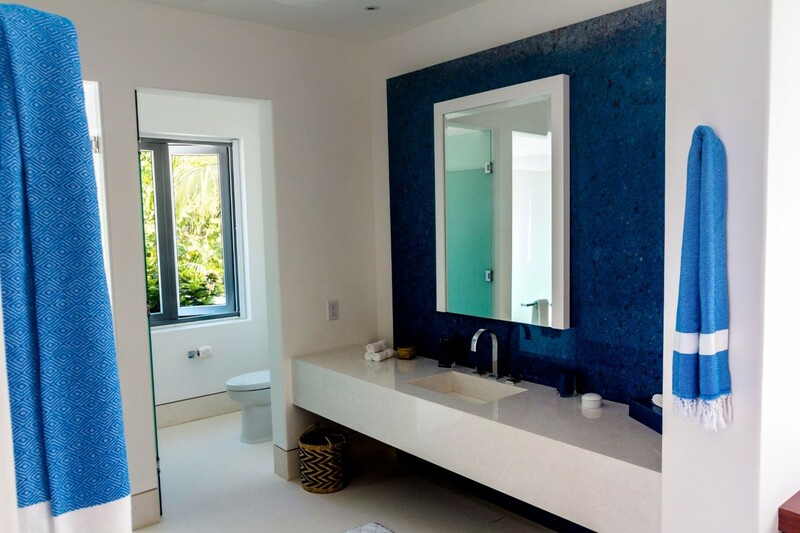 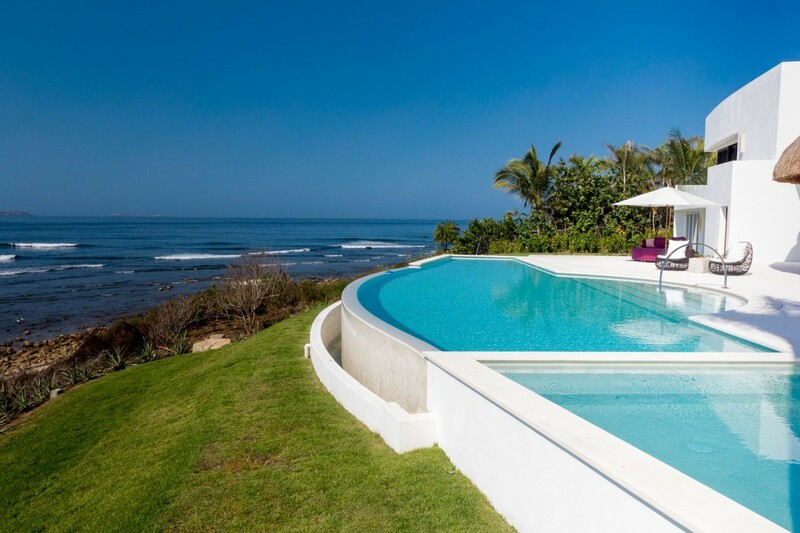 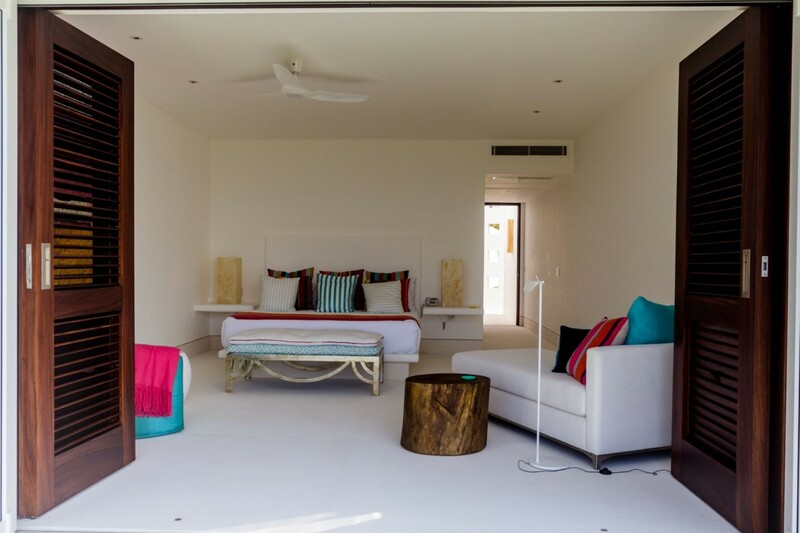 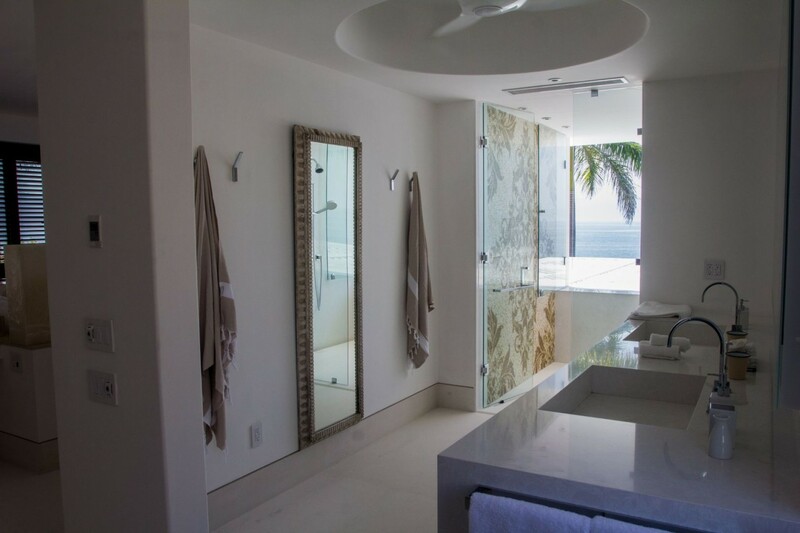 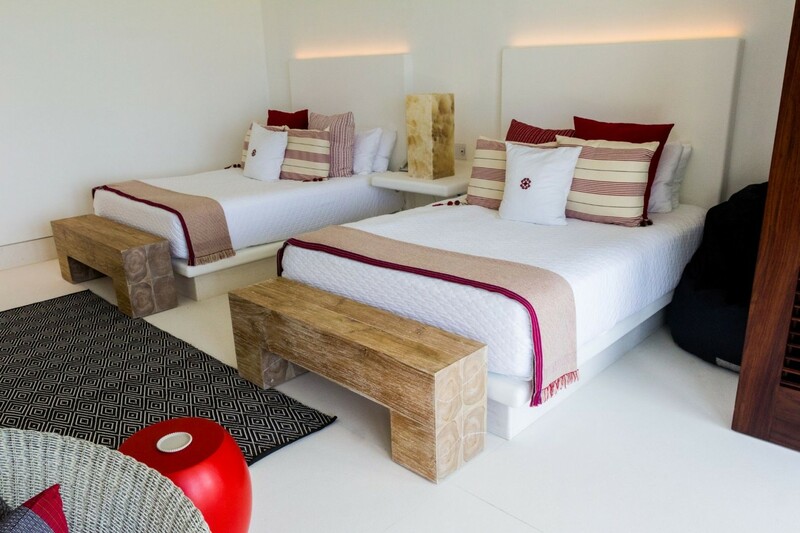 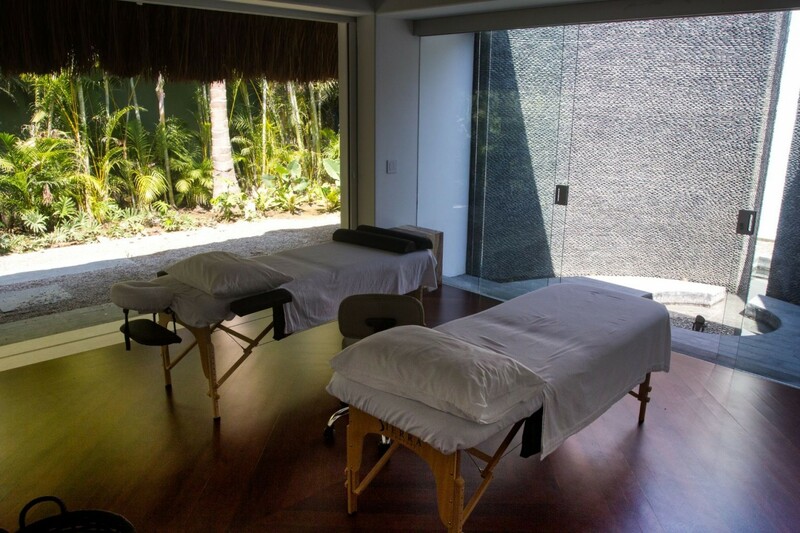 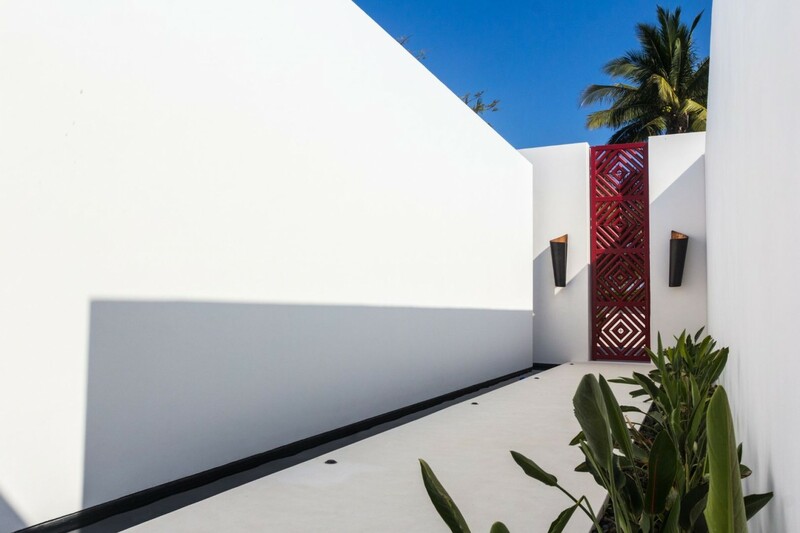 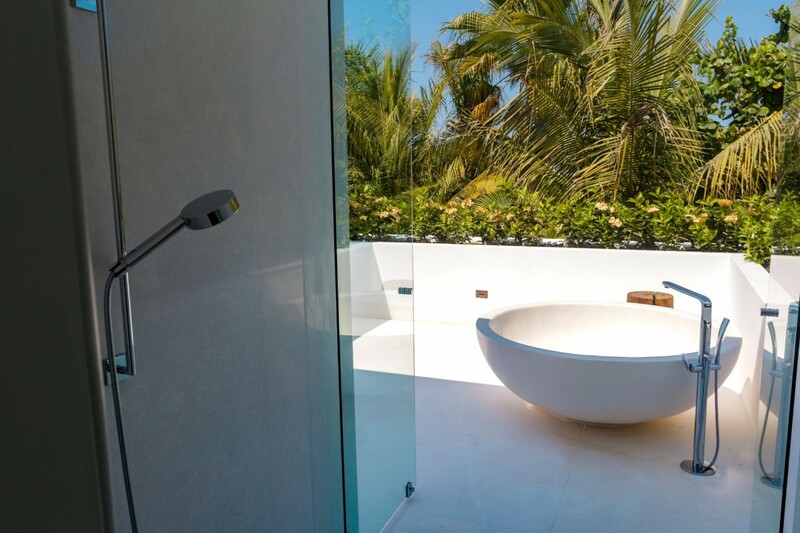 Though located in a secluded area that offers privacy and seclusion, the villa remains quite close to the town of Punta de Mita, offering easy access and convenience to bars, restaurants and shops. 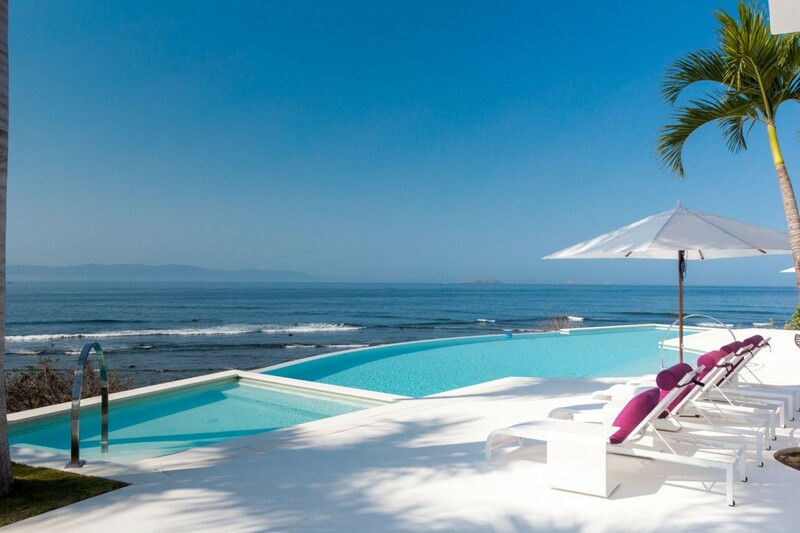 Punta Mita Adventures is the first choice for tours and activities in the area, offering zip lines, dolphin swims, sailing, snorkeling, scuba diving, flyboarding, surfing, stand up paddle boarding, and much more besides as part of its repertoire of excursions. 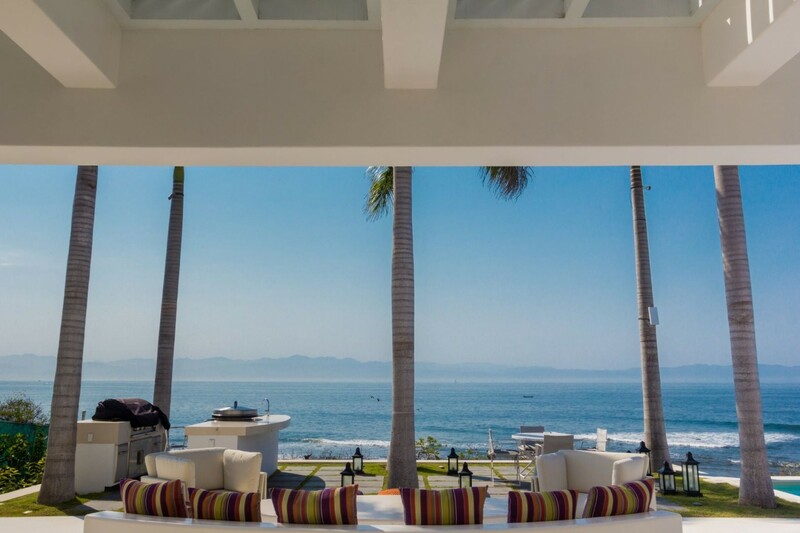 Further down the coast, Puerto Vallarta, a Mexican beach resort city, is an hour’s drive away by car (46km), with a healthy night life scene, shopping malls, plenty of beaches and an interesting history.